Milwaukee has been home for the past 43 years! Where did you work prior to joining The Hop? I worked as a medical assistant/caretaker and was a school bus driver. What transit experience have you had? I was a school bus driver for about 7 years. 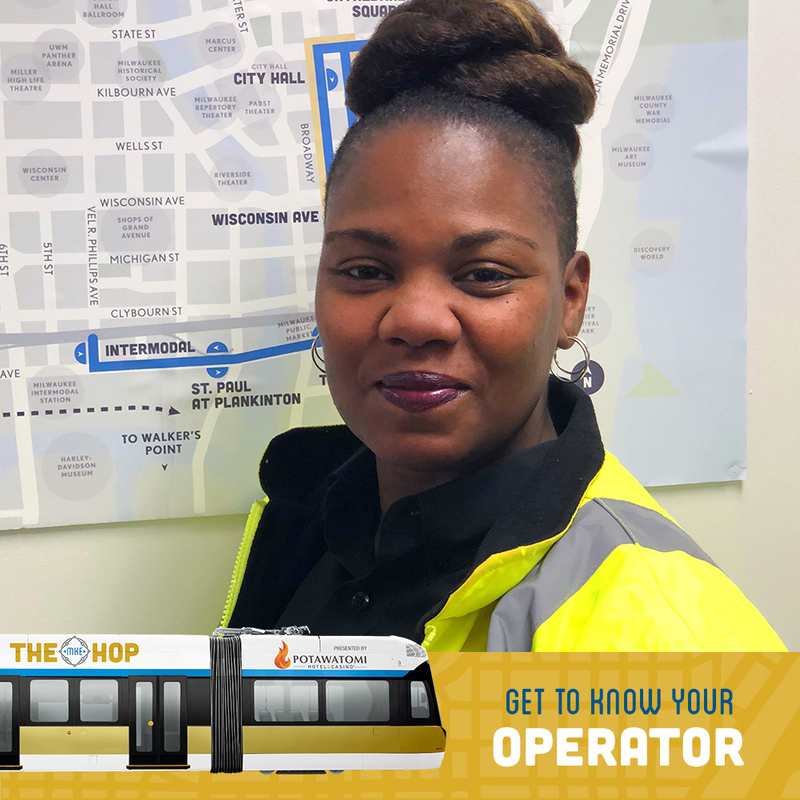 Why did you decide to pursue an operator position with The Hop? It was something different. When I first heard about it, it sounded like something new and kind of adventurous—something great for the Milwaukee area. It took me a while to apply, but the job itself seemed like a perfect fit. I wanted to be part of something new that was coming to Milwaukee. What is something that has stood out while being a part of The Hop? Change! This was very exciting and new to me. Some people take to this in a positive way and others in a negative way. But our training on how to deal with this new, big piece of machinery in the neighborhoods was very good. I felt very prepared! Being a part of history here in Milwaukee. I had never experienced or even ridden on a streetcar before, and now I operate one. It’s an exciting time for the city. And I’m a people person. I love dealing with the public and I get that interaction every day! When we get to Burns Commons and switch sides, you get to see little kids’ faces light up and I give them a high five. Even some of the adults like to get in on the action and get high fives. What’s your favorite thing about Milwaukee? I’ve seen Milwaukee change over the years and for the most part it’s been positive. There are a lot of things going on here. Our downtown is growing—there are a lot of little places I’ve never heard of or experienced. There are so many places to see and explore in our city. I love Milwaukee and there is so much diversity and a lot of things to do!